It’s difficult not to like the actors in Douglas Carter Bean’s “Mr. and Mrs. Fitch. Sandy Campbell’s overall versatility, acting and singing has been established for many moons. She took home a Craig Noel Award for her portrayal of Maria Callas in “Master Class” at the now defunct Ion Theatre and was absolutely the tragic figure as Lucille Frank, wife of Leo Frank in Cygnets excellently mounted, “Parade”. Playing these characters as well as Mr. Fitch is the height of this talented woman’s being. Andrew Oswald recently closed in “The Hour of Great Mercy” to standout critical acclaim at Diversionary. His credits also include Harry in “Company” and Charlie in “The Whale” at Cygnet. He has been seen at Backyard Renaissance in “The Elephant Man”. He, too, is a man on the go around the San Diego scene. Neither is a slacker, both are attractive and play well off one another in Backyard Renaissance production of “Mr. and Mrs. Fitch” directed by Francis Gercke with an eye for perfection and fun, now playing at the Moxie Theatre in Rolando through April 14th. Funnier than the play itself though, the two appear to be actually having a fun time with each other and the material as they shoot zingers at each other faster that the speed of light; some work, others fall flat. So amused at themselves they almost lose their social standing as gossip moguls by not recognizing that what goes up has to come down, or when ideas are not as clever as they used to be, or the well is dry. Their necks werein a proverbial noose after they made a major mistake in their column claiming the appearance of one called ‘Tall and Frosted’ whom they reported was in attendance at their latest social gathering, was in fact dead. It didn’t help either that their last final paragraph came up empty. Something had to change, and fast. 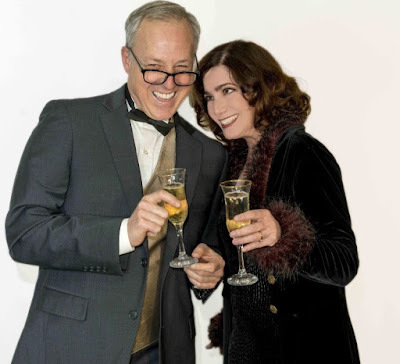 Being the clever New York Martini drinking twosome they show up to be, they invent a fictitious celebrity, Jamie Glenn in order to get back into the game. When their readership buys it, and they do, they are so pleased with themselves and their cleverness they fall all over themselves downing it, then again, with another Martini. So much was their good fortune, they were invited to an important dinner party, that gave Ms. John another reason to show off yet another gorgeous gown and Oswald, playing the closeted gay, to look very handsome in his tux. Sooner or later the couple would fall victim to the Internet, instagram, twitter and blogs. They will have their their ideas usurped, but no worries. Some people are just survivors, and oft time amid the nonsense and constant use of blogs, twitter and computer talk, some truths peek through as when they refer to fake news, something of which we are all aware. To those looking in with 2019 eyes (the play premiered in 2010) off Broadway) it might a bit of a turn off when too much cleverness is too much and when they drop names like Yeats, Sontag, Shakespeare or Hemmingway to prove a point or “When life gave me lemons, I made citron pressé”. Seriously? What the hell is that? But never mind. Joel Britt’s lighting design along with Tony Cucuzzella’s detailed and awesome set design, and mentioned once but deserves another look, John’s outfits are more interesting than Mrs. Fitch herself. Sound is credited to TJ Fucella but when Oswald sits at the piano and Campbell sings along Cole Porter’s “Mr. and Missus Fitch” from his 1932 play “The Gay Divorce”, later made into the film “The Gay Divorcé” starring Fred Astaire and Ginger Rogers all is good with the world. 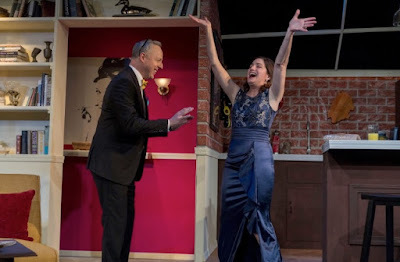 Fortunately, unlike the couple in Bean’s play The Fitches played with confidence and clarity by Campbell and Oswald worked their combined talents and grit into to making the celebrity couple look like they were the crème de crème of high society gossip. I call that top notch acting. Douglas Carter Bean is no stranger to San Diego audiences. Three of his popular works were produced in local theatres: “The Little Dog Laughed”, “As Bees in Honey Drown” and “Xanadu”. So continue on Mr. Bean and lets have some fun with ‘The Fitch’s’.